↑ 1.0 1.1 1.2 Murphy, Kelly with Hallie Fryd (2013). Historical Heartthrobs: 50 Timeless Crushes-From Cleopatra to Camus. USA: Zest Books. p. 109. ↑ See, Jen. 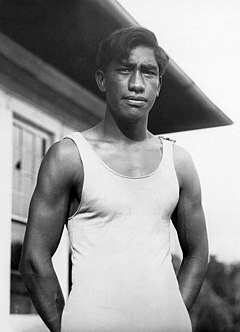 "5 Things You Didn't Know About Duke Kahanamoku". MensJournal.com. Men's Journal. Retrieved August 25, 2015. ↑ Hall, Sandra Kimberly. (2004). Duke: A Great Hawaiian. Honolulu, HI: Bess Press. ISBN 1-57306-230-8. This page was last changed on 17 June 2018, at 11:30.